It's been over two and a half years since I've bought a camera. I don't buy them any more often than I need to. I've also never bounced around from brand to brand looking for greener grass, while at the same time I've never felt so tied to one brand that I wouldn't buy from another maker if they had the exact thing I needed. Back in early 2004 I had to buy a digital camera in order to accept a large assignment that needed to be done in digital capture. Despite a closet full of Nikon gear from F2 to F4 and several generations of glass, I decided that for my needs the whole "legacy" equipment issue was pretty irrelevant. I found that I really liked the Olympus E-1 camera and its digital Zuiko lenses. But there was also a special factor—the Olympus "dust buster" designed to prevent particles from accumulating on the sensor. Am I some technophobe afraid to deal with an occasional need to roll up my sleeves and go inside the camera? Hardly. The thing was, that assignment was to shoot an entire book of bathroom remodeling projects. Hundreds of step-by-step illustrations in cramped surroundings immersed in sawdust, gyp-board dust, wallboard mud dust, tile groat dust: every kind of dust in the known universe! If the widget just cut back on the number of cleanings I'd have to do, and cut down on the amount of retouching between cleanings, it would be worth its weight in gold. Because of the cramped shooting conditions, short lenses would be vital and the 4/3rds designed-for-digital system excels at short lens performance. I lucked out. Thirty months and more than 40,000 exposures later, I've never found a speck of sensor dust. Now however, for reasons anyone can imagine, I really need to have access to at least twice as many pixels as the E-1's five million. There have been delays in the release of the E-1 replacement, and Pentax came out with the K10D, a 10-MP camera with overall specs that are quite amazing in view of its price point. But the kicker is that Pentax also has a trio of compact prime lenses. The Olympus road map shows no plans for this (neither do the Canon/Nikon big boys). To someone who has worked with M Leicas since 1967, that's a problem. While the image quality of the digital Zuiko zooms is excellent, I constantly find myself wishing for far less bulky lenses. So the die was cast, the "notify when in stock" order went out to B&H, and a week ago the camera arrived with 21 and 40mm lenses. Will I be as happy with this decision as I have been with the Olympus purchase? Only time will tell. If Oly introduces a totally killer E-1 replacement in the next year and I decide that I want it to use with those zooms, I figure I won't regret the Pentax purchase because I'll still want the smaller camera and compact lenses for much of my work. That little lens cap screws into the round opening in the lens shade, so the shade really never needs to be removed except to use filters. ￼ Sure, the rangefinder camera is smaller, and that lens is 1.3 stops faster than the Pentax 21mm. But really, it isn't all that much smaller! I was quite surprised when I set them down next to each other. So you're saying "enough already with pictures of the camera; show me what kind of pictures the camera can make!" Next time. When I've had more experience with it. If you want a sneak peek, though, hop over to my web log where some of my first pictures with the K10D make up the past few days' postings. You can tell when the Pentax pictures start because of the skinny 2:3 format compared to the fatter 4/3rds format of earlier posts. One last thing: the K10D also has a dust-buster, Pentax-style. I like your approach of a) not being slavishly devoted to one pet brand, and b) making comparisons according to the features you actually need. Good advice, and interesting article. I too am interested in the Pentax due to the primes. Currently using Oly as well. So Carl.......why not an M8 ? the problem of the cost is also tobe considered. But you (one) can buy it's OK then. I used Nikon equipment before turning to digital Canon. A major reason why not an M8 is that it costs 5.4X as much as the K10D. I suspect my 28mm Elmarit from 1967 is too old to be compatible (it extends so far into the body that M6 metering can't cope with it) so I'd have to buy a newer 28 to have my key focal length of around 35mm equivalent. That's $2200 or $3200 more, while the old 28 remains superb for work on film and doesn't need to be updated. Then, to say that the introduction of the M8 has been less than trouble-free quite understates the case. Mainly, I don't think digital capture is mature enough yet to sink that much of my scarce money into a camera body. I'll keep watching. Guess I am not suprised by your answer one bit. I was just curious. I will keep an eye out for more of your fine work with that Pentax. Not sure how much you do, but I'd be real curious how you feel it handles in low light. I do a bit of Street stuff at night but my E300 is not the best tool for that work. Has it been easy for you to adjust to the new aspect ratio? I like the E-1 because it's the same proportion as my digicam (F30). Very tempted by the new Nikons and Pentaxes, but I can't get around the fact that I like the 4/3 aspect ratio. And I think Oly is preparing some pretty nice cameras next year, so I'm afraid to change. I just went back over the 4:3 to 3:2 transition zone in your blog to see what the difference was in terms of how the pictures look. The Pentax and the Olympus probably feel about the same, but one has nice zooms and the other simple primes. Am I right in thinking that you are seeing a little deeper into the shadows of the scene with the Pentax? Has any of the bathroom dust accumulated on the Zuiko lenses to contribute to the difference? Given that you are not shooting moments caught among unsuspecting subjects, I can't see any rush to the M8, and very likely its sensor will show up in the next generation of Olympus products, with proper IR protection. The 2:3 aspect ratio feels like a homecoming, being an imitation of the Leica ratio. At the same time I still like the 4/3s ratio and will continue to work with it. Aspect ratio is interesting. I've done a lot of work with view cameras intended for contact printing in platinum. I travel with 5x7, 8x10, 7x17, and 12x20 inch cameras and the choice of which one to use for a given subject is based on the aspect ratio as much as the size. I've spotted this photo of an astronaut at the Space Station, iss014e08795.jpg. There are a few white canisters tied to the wall at the right with grren things inside that actually look like Fuji's... Are they still using film up there? Wouldn't it be funny considering what Nasa has done to the development of the digital image? Another prime lens fan interested on the Pentax. Still, my choice of primes is slightly different: 31mm and 77mm, two of the non-pancake Limiteds. The idea is basically to have a normal lens and a short portrait telephoto. 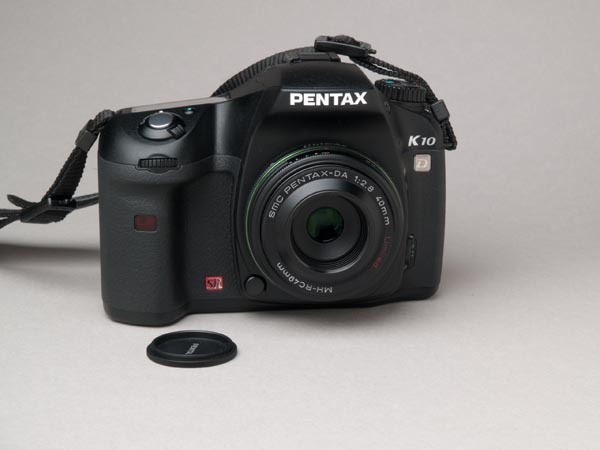 Also, a really really funny thing is that not few of the Pentax fans think the K10D is too big! Guess you just can't please everyone eh? But you're 100% right! Great choice of camera (both Oly and Pentax) and great post! Thanks a lot, and take care! "I've spotted this photo of an astronaut at the Space Station, iss014e08795.jpg"
Was there supposed to be a link with this? And Scott Kirkpatrick mentions the M8 and suggests the next generation of it's sensor may end up in a future Olympus camera. The M8 uses a much larger sensor than 4/3 cameras (roughly twice the area). Leica does have a 4/3 camera, and it uses the same Panasonic nMOS sensor as Olympus' E-330 camera. "Tip: Instead of using that stupid screw-in lenscap on the 40mm, use the cap from a Fuji filmbox, it pops right in. :)"
The labels on the two nearest canisters almost certainly say "Nikon F5" (3rd line), so there's the confirmation. Also, there's a very F5-ish Nikon camera hanging just above the top left hand corner of the manual the guy's reading. "Also, there's a very F5-ish Nikon camera hanging just above the top left hand corner of the manual the guy's reading." And isn't that an F5 just under the table? @impasse, fogg: In fact, from the second foto it appears that the F5 is the one under the table as impasse points out, while the one above the manual is a D?x (white patch on vertical grip). And let's see: another D?x, a Kodak backed body, a weird two-lens film stereo (?) camera (on the left edge -- can anybody come up with more specifics for this one?)... what else? Thanks for the article, Carl. I will be most interested in your impressions of the camera and the image quality as you get more time to use it. I still have fond memories of my old Pentax SLRs and would love to have a good DSLR that takes small sharp primes. I think that is unmistakably at least one film cartridge, on an '06 mission! But that F5 could be digital, too. "Nikon products have been mounted on every manned American spaceflight since Apollo 15"... including "the F5-based digital camera (produced by Kodak)." Anyway, plenty of intriguing info out there if one's interested. It surprised me that it wasn't until 2005 that one of the external tank film cameras was replaced w/ a digital (again Nikon F5-based), but it shouldn't have: NASA sticks with proven equipment, as they should. On the other hand, it didn't surprise me at all that the Russians use film. I'm not sure there is any interest. But I was lucky enough to grab a K10D the day it came out. It is a phenomenal camera and it is far better than my 300d in nearly every way. In any case, every picture after this one on my photo blog was taken with this camera. I'm very happy I made the switch. Pentax really got it right this time.